Many ​cars come with substandard ​speakers, and you may want to ​replace them ​with ​ones that meets your requirements. Component speakers are the best ​system for a car because they ​produce good quality sound. However, choosing the best component speakers is not that easy. There are several things that you need to consider. A component speaker usually includes a pair of tweeters, crossovers, and mid-bass driver. The frequency range, sensitivity and pair of tweeters matters a lot. Choosing the right one can be a tricky job, but there is an easy way to do it. This measures the amount of sound a speaker produces from the power supplied to it. A speaker with high sensitivity ratings (over 90 dB) is a perfect choice if you have a low-powered car stereo. For high-power system (16 watts RMS or higher), choose speakers with low sensitivity ratings. Speakers with adequate power provide ​excellent sound quality. Power handling will determine the amount of electricity your speaker can handle. For the low-powered sound system, your speakers may not be able to handle lots of power. On the other hand, those with powerful external amps need speakers whose power handling is almost the same ​as the amp output. ​The RMS measures the amount of power the speaker can handle if used continuously. The durability and sound quality of a speaker will depend on the materials used in manufacturing it. The woofer of your component speaker should have stiff material but be lightweight to produce the low notes of your music. Manufacturers of car speakers make ​woofers ​out of synthetic films such as polypropylene, in combination with other materials such as mica, to make it stiffer. Component speakers covered with woven fabrics or synthetics with metals like titanium or aluminum are very durable and lightweight. Speakers made of this can withstand heat, cold and moisture. The tweeter elements can affect the type of sound it produces. Most are ​made of soft materials such as textile blends, silk or poly to provide ​sound that is mellow and refined. If you prefer snappy ​highs, ​choose the one with hard materials such as graphite, metal or ceramics. The surround plays a vital role. It lets the woofer cone move freely and releases bolder bass. It should have sturdy material to withstand the humidity and changes in temperature. Choose the one that is made of rubber since it can last longer and provide the best performance. Cloth and foam surrounds cost less, but still perform well. Alpine designs this Type-R speaker is for individuals who like to turn it up. They produce big, dynamic sound with lots of bass - perfect for your car stereo. This component system features 6-3/4 inches multi-layer hybrid fiber woofers that provides a strong bass response. SPR 60C produce consistent, extended cone movement that pushes a lot of air. Its silk tweeters emit smooth highs that bring out your music’s detail and depth without shrillness. It has an EQ ring in front of the tweeters to disperse the highs for a bigger listening sweet spot. These component speakers are smaller than the traditional magnets and use powerful neodymium magnets. Excellent grip over bass and sound. The Kenwood KFC –P709P component speaker woofer is one of its most essential components, and it affects the sound quality. The woofer is made of high-quality polypropylene cone that can survive the test of time and can make a clearer sound. Kenwood KFC has urethane foam surround, it was known for its durability, which only means that it will last longer. Because of this it becomes responsive and reduces the possibility of distortion which comes from external vibrations. Crystal crisp, clear sound, the audio is as clear as possible. Mounting the speaker is not a problem at all since all the tools needed are included in the package. The instructions are detailed thus you will not have a problem assembling it. Even without an amp it still provides a clear sound. The tweeter is not as impressive ​as others. If you are looking for aftermarket speakers, the Infinity Reference 6030s component system is a perfect choice. It has 2-ohm voice coil, ideal for running directly off of a head unit or ​an aftermarket amp. The manufacturers of Infinity have combined the Plus One+ cone along with high roll rubber surround to maintain the integrity of the sound. This speaker works in all applications. It is also known for its True Four Ohm Technology which makes it perfect for running directly from a head unit or with an aftermarket amp and head unit. The manufacturers have made some adjustments so it can be connected to any head unit safely. Its rubber surrounds woofer provides the best cone-edge suspension and can absorb distortions. With the edge-driven textile dome tweeter, it can increase power handling and lessen distortion at high output levels. It has better integration with the mid/woofer as compared to others. It has a pair of laboratory optimized passive crossover networks with tweeter adjustments. The package includes Infinity’s patented I-Mount tweeter mounting kit. ​Compared to other component speaker brands, Polk’s new 2007 DB series looks better and sounds better, and comes at an affordable price. 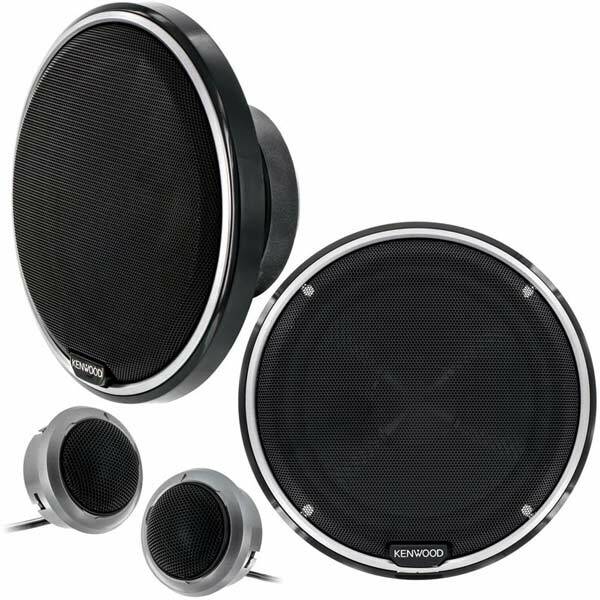 It is a 6.5 inch 2-way component speaker that functions perfectly in OEM factory systems, and with high-powered aftermarket head units and component power amps. It can withstand the changing of the weather, so they are ideal for boats of all types. It has a dome tweeter, and its neodymium magnet provides clear and detailed highs. It has mounted swivel cups that enable placement flexibility for better sound in your car. The woofers feature a dynamic balance polymer composite mineral-filled cone, which is stiff but lightweight, for big sound with less distortion. The rubber surround will not fall apart when subjected to stress, sunlight, or temperatures. You can use them as front speakers or back, these look great everywhere. JBL is the perfect upgrade to your existing speakers. They are manufactured with a carbon-injected cone material to produce sound accurately. Its 3-ohm voice coils enable the speaker to function at an efficient 4-ohms when being powered, using ​every watt of electricity your head-unit or 4-ohm stable amp can produce. It has a vented magnet with a large thermal-capable voice coil which distributes heat efficiently. The cone enables greater sound levels with the same amount of power. JBL GTO609C has a carbon-injected ​cone that ​moves more air and produces more bass. Feature larger voice coils for better heat distribution and a higher power that result in fatigue free tops. Has dual-level tweeter volume adjustment that compensates for less-than-perfect speaker placement. It also has low-impedance, 3-ohm speakers compatible for the tiny wires. The five best component speakers above provide better sound and are perfect for ​any vehicle. However, if you consider the above features, Alpine SPR 60C is the best. Next is the JBL GTO609C; ​they only differ in price since as this costs less ​compared to Alpine. Three of the ​products above lack bass, which is an important characteristic.